Happy Thanksgiving (and safe travels for those visiting friends & family out of state)! I saw my family last week so I missed the holiday traffic. 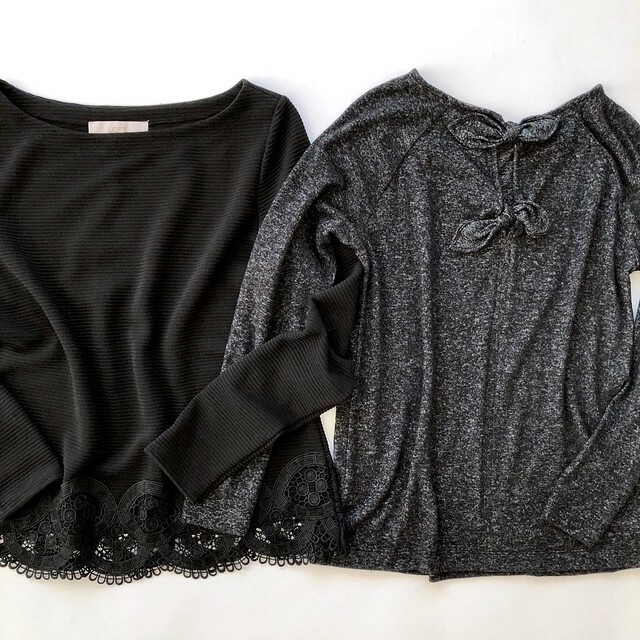 I wanted to share two outfit ideas with a new top and sweater that I recently received. 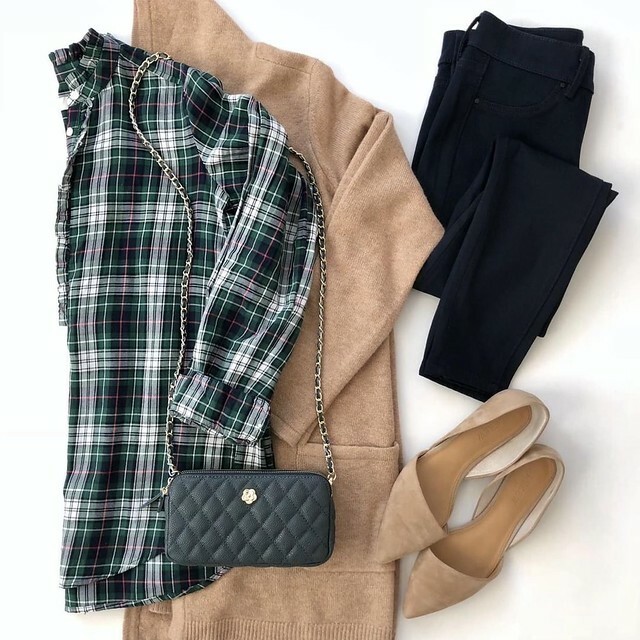 I love this outfit for the holidays since plaid is always a good idea for looking festive but not too festive. 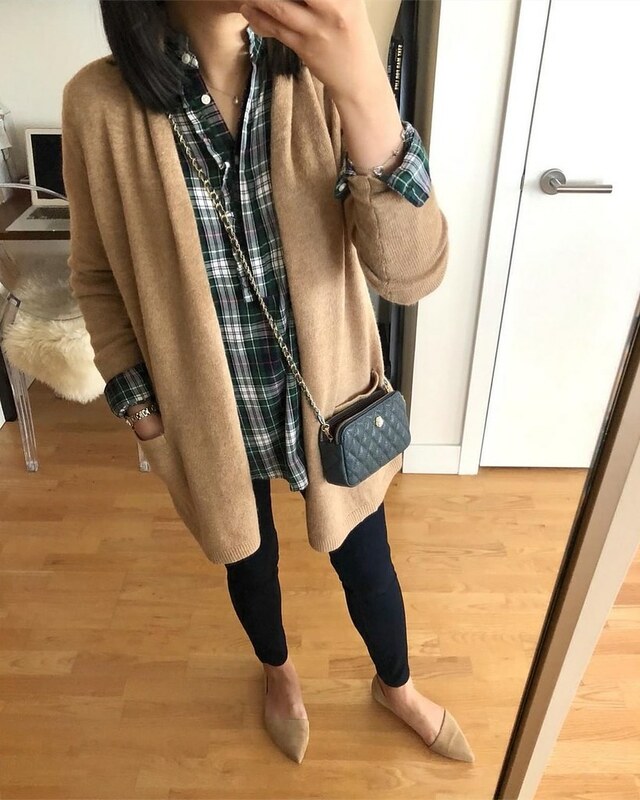 The plaid top has a very loose fit (review below) but the oversized cardigan helps to cover up the less than ideal fit. Click here and here to see a close up of the quilted wallet on chain which has a middle compartment that fits my iPhone 8+ perfectly. This festive fairisle sweater looks cuter on and I’m glad I gave it a chance since it did not look like much on the tables in store. It runs true to size and it has a very relaxed, swingy fit through the waist and hips which I love so that you can eat a large meal comfortably. 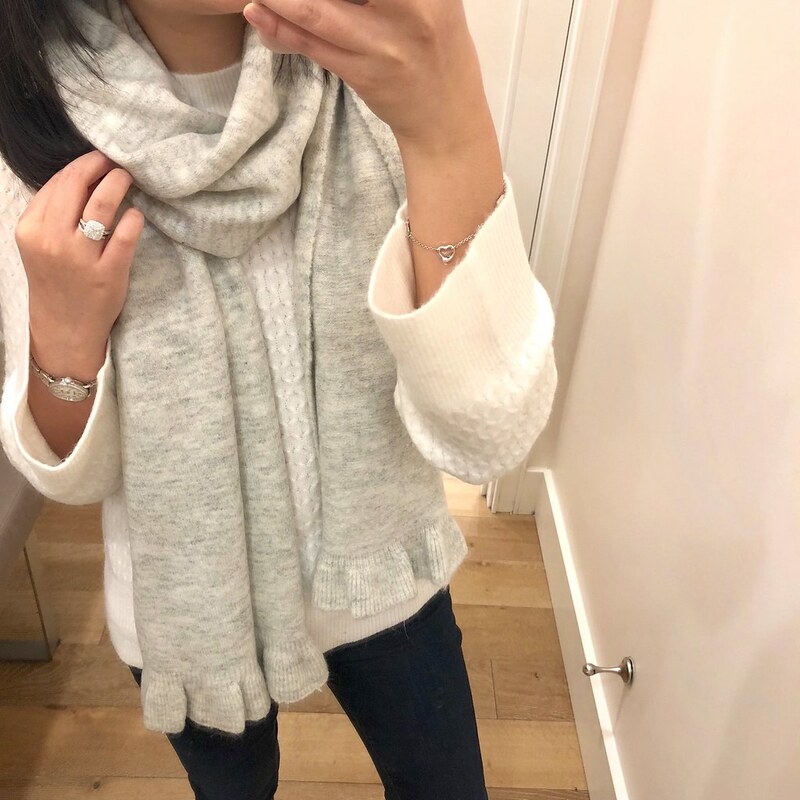 The sweater is shorter in petites so you may want to try the regular missy sizes if you prefer extra length to cover your bum. Update 12/19: This sweater contains wool and after wearing it yesterday I would say it’s definitely a itchy sweater. Also the sleeves at my forearms (where that chevron pattern hits) and at shoulders are a bit snug. It’s a relay cute sweater and I did get a few compliments on it. 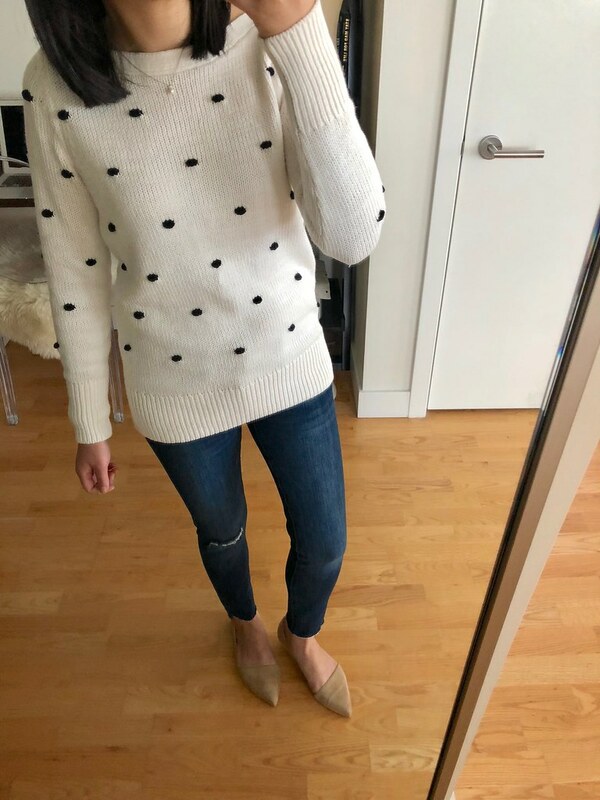 I really wanted to love this sweater because of the cute pom pom/dot detail but I think the sweater just looks okay on me. It’s slightly longer since I’m only 5′ 2.5″ and it’s only offered in regular missy sizes. I also didn’t love that the ribbed band at the hips is more fitted as opposed to flowing away from the body which is what I usually prefer for tops and sweaters. I love this black tee with with the ribbed texture and pretty lace hem for added interest. I wish it came in other colors. It runs true to size for a relaxed fit. Click here to see the bows in the back. This tee is very soft and it runs true to size for a relaxed fit. I believe I could even size down to size XXSP for a closer fit. 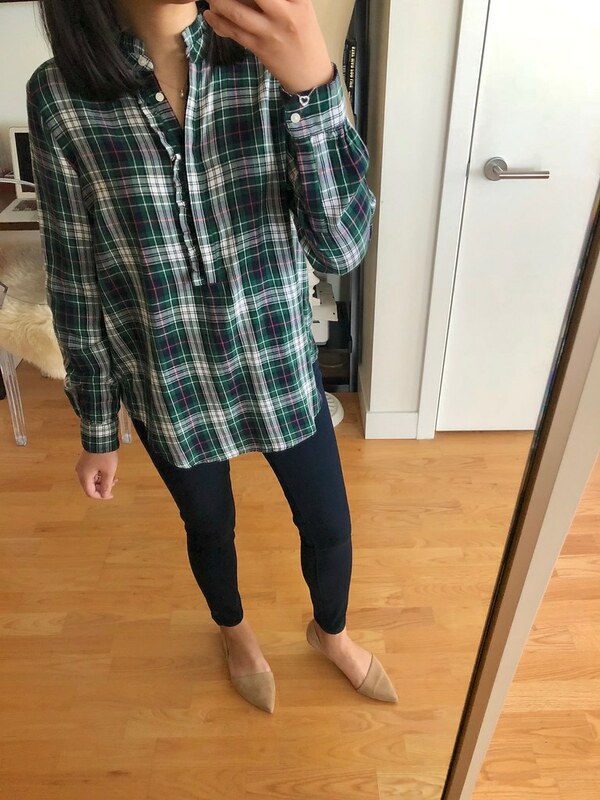 This plaid top runs at least one size larger. I wish it came in petites since size XXS regular is very oversized on me. I love the colors and the ruffles on the placket. 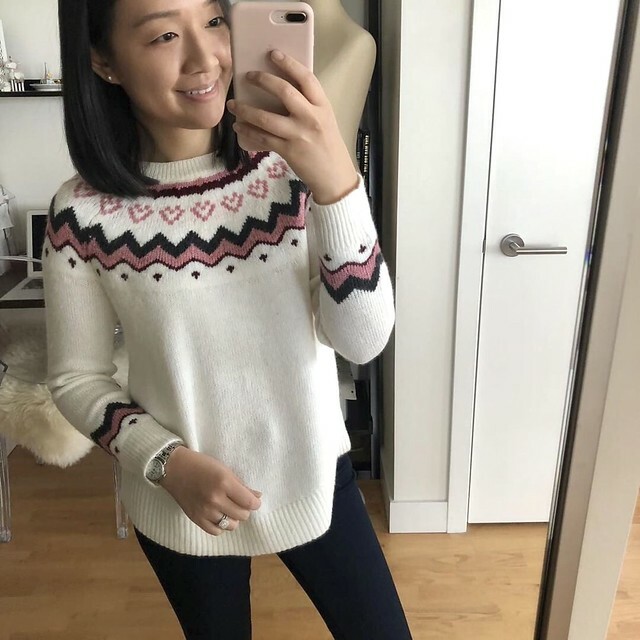 I’m very tempted to keep it to wear it this holiday with my camel cardigan as styled at the top of this post in order to hide the oversized fit. My husband got this shirt to match me in his usual size (shop more of his picks here). Update 12/19: Check out my updated review of size XXSP here. 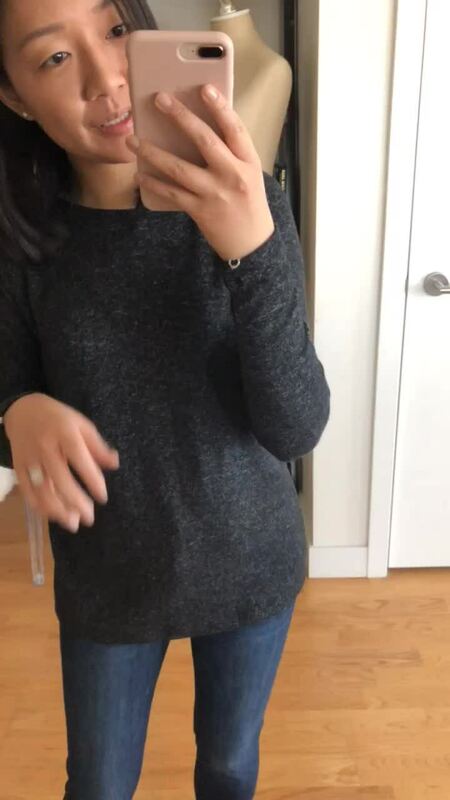 This sweater is really cute but it’s a bit more fitted at the hips than I prefer so you can see the bumps from the button fly of my jeans. It runs true to size so I may need to try size SP for comparison. This tee fits true to size and it’s not too fitted. It has a longer overall length so I’m on the fence about keeping it but I like the button detail on the sleeves. I love the ruffle edges on this scarf. I got this grey color and my mom got the lilac color. This blouse fits true to size for a flowy fit. It’s slightly sheer so a layering cami is recommended. I previously reviewed the navy color here. 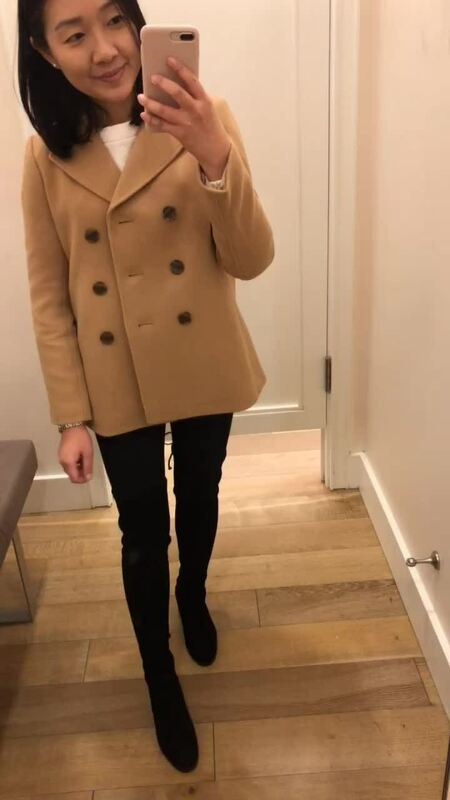 In my opinion this peacoat somehow looks like it fits boxier in the camel color. It runs one size larger and has a boxy fit which makes perfect for layering underneath. It’s mid weight so it’s not very warm on it’s own so it’s ideal for early fall or those that live somewhere where it doesn’t get too cold in the winter. This Express trench runs true to size for a closer fit. Size XXS regular is a bit snug on me through the shoulders with a thin sweater. Unlike LOFT vanity sizing this trench does not have a relaxed fit. If you’re curvy or want to layer underneath comfortably then you may want to size up. 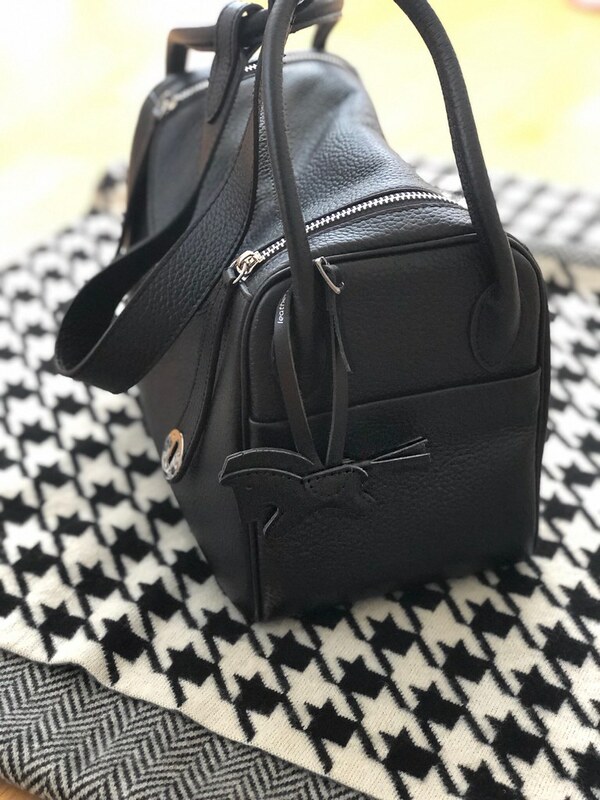 The trench is a very classic style with minimal details but the only thing I didn’t love was the silver zippers for the pockets instead of side entry style open welt pockets. I ordered the black color to try it on for sizing but I would prefer the khaki color. Update: I have since returned the black color. Leather Prince bag charms are so cute. Before ordering this one for $58.50 I had originally ordered this $13.90 horse bag charm from Amazon but it was too big and overwhelming. This mini horse is just the right size for added interest while not being too cutesy. I do wish that his branding logo did not show on the outer hanging strap. 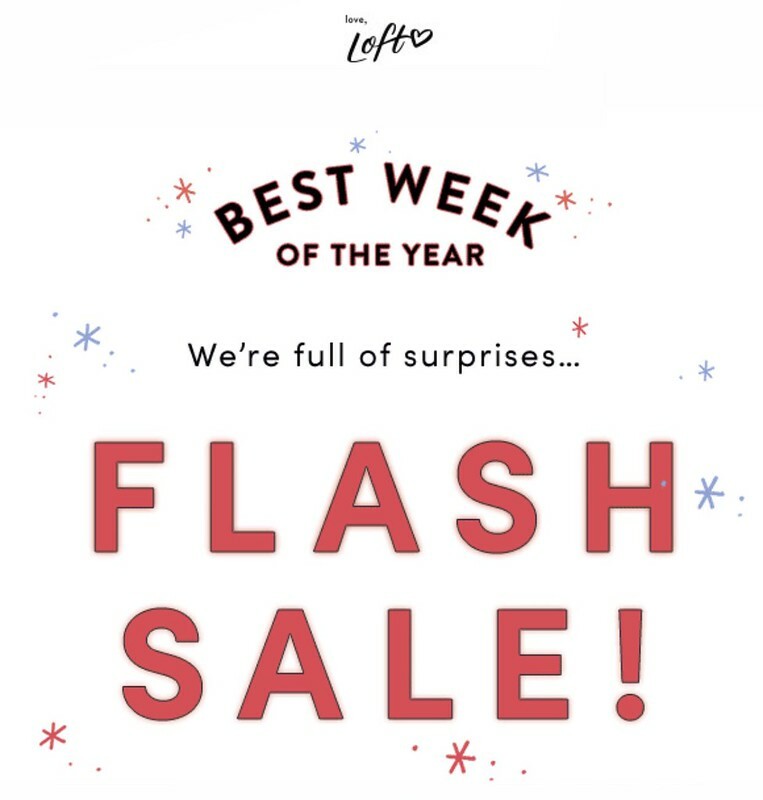 LOFT – Flash sale alert! Get 50% your purchase with code FRIYAY. Valid online only but you can use the pick up in store option if the item is in stock at your local store. Sale ends 11/24 at 11:00PM ET. They’ll likely extend the sale and include free shipping since it’s historically been 50% off plus free shipping in previous years for Cyber Monday. If you plan to shop in store they will be giving out a free floral tote for Black Friday as seen here on purchases of $75+ (while supplies last). They will launch the exclusive Black Friyay collection although many pieces have already been available in stores since last week. They have also historically offered 50% off with free shipping for Cyber Monday. Refer to my LOFT reviews here. Shop my favorite sales picks linked to this post from my Insta Shop. Note: The above codes do not work on items that already require the FRIYAY code for 50% off. They also exclude Lou & Grey styles. Lastly, the shopping cart only accepts one code at checkout. 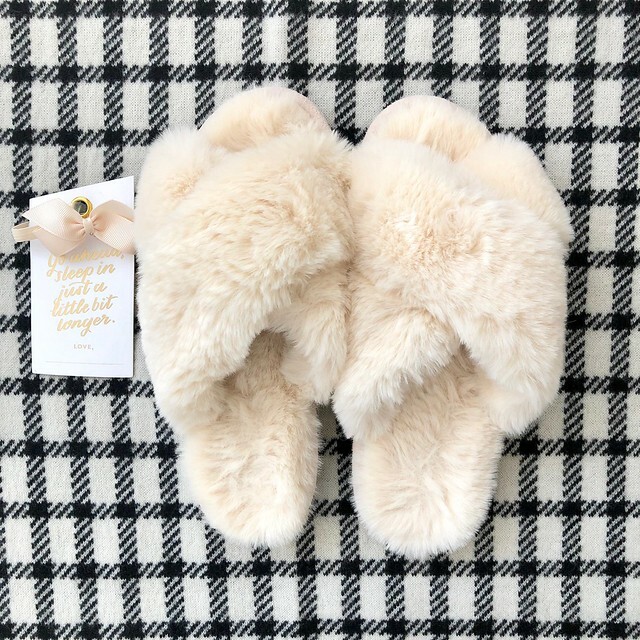 – Thursday, November 22 – $12 faux fur slippers (also check out the pricier Lou & Grey version which are made out of 100% Aussie sheepskin). These slippers run true to size. I took size M and I wear size 7. I was home last week visiting my family and I had my mom and sister try on the slippers too, My mom wears size 8 and they fit her and my little sister wears size 8.5 and size M fits her as well. My friend Jenna is size 8.5 and she said that size L fits her with room to spare. Out of curiosity I had also slipped on size S in store but it was too small and I felt like my feet were going to hang out of them on the edges. Click here to view the clip from my try-on. – Friday, November 23 – The coziest sweaters now $20. – Saturday, November 24 – 60% off leggings to live in. – Sunday, November 25 – Our favorite coat now $89. Shop and earn $25 LOFT Cash for every $50 full-price purchase in stores and online now through December 3, 2018. LOFT cash can be redeemed December 4 – 17 for $25 off every full-price purchase of $50+ in stores and online. Click to read and learn more about LOFT cash redemption. LOFT OUTLET – Get 50% off major steals + an extra 15% off with code TRAVELFUN. Valid online only through November 22, 2018 3AM EST. ANN TAYLOR – Get 50% off everything. Use code BLACKFRIDAY. Sale ends 11/24 at 11PM ET. Valid in stores and online. Historically the have included free shipping once the sale is upgraded for Cyber Monday. Refer to my Ann Taylor reviews here. Shop a few of my favorite sales picks linked to this post from my Insta Shop. ANN TAYLOR FACTORY – Get 50-70% off almost every single thing + save an extra 15% off. Use code FRIDAY15. Valid through 11/24 in stores and online. AERIE – Get 40% off plus free shipping! I love these seamless undies and took size XXS. If you need something quickly AERIE is part of ShopRunner just like Ann Taylor so you get free 2-day shipping. ABERCROMBIE – Get 50% off the entire store plus free shipping on all orders. AMAZON – Check out their extensive list of Black Friday deals. My husband and I were recently gifted the Echo dot smart speaker with Alexa which is currently $19.99 and it’s convenient for checking the news, setting reminders and asking questions when you want to know something. It has a lot of other skills that we haven’t yet figured out. You can always check out other product recommendations on my dedicated Amazon shop. BAGGU – Get up to 30% off and free shipping on orders of $30+. I love Baggu’s reusable grocery bags which fold neatly into their little square pouches. I discovered this brand through a collaboration they did with J.Crew years ago. My mom is always asking me for new prints. DSW – Get 20% off everything with code MADHOUSE plus get a free weekender tote with code FREEBIE. 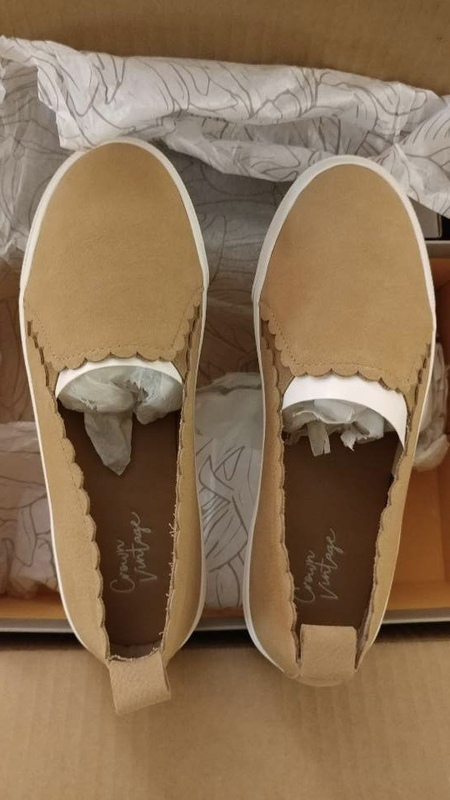 Last week I ordered these cute slip on sneakers and these comfy loafers when I was in Philly visiting my family but they didn’t arrive in time before I came back to Boston (my little sister is helping me return them). I’m debating on reordering them again to try. Update: My little sister kindly sent me these photos of the shoes since I didn’t get a chance to see them in person myself. EXPRESS – Get 50% off everything + free shipping on any order. Valid through 11/24 2:59AM ET . Express cardmembers get an extra 5% off in stores only. I ordered this classic double breasted trench coat (it’s also available in petites) after seeing it on Annie. Size XXS regular is a close fit on me. 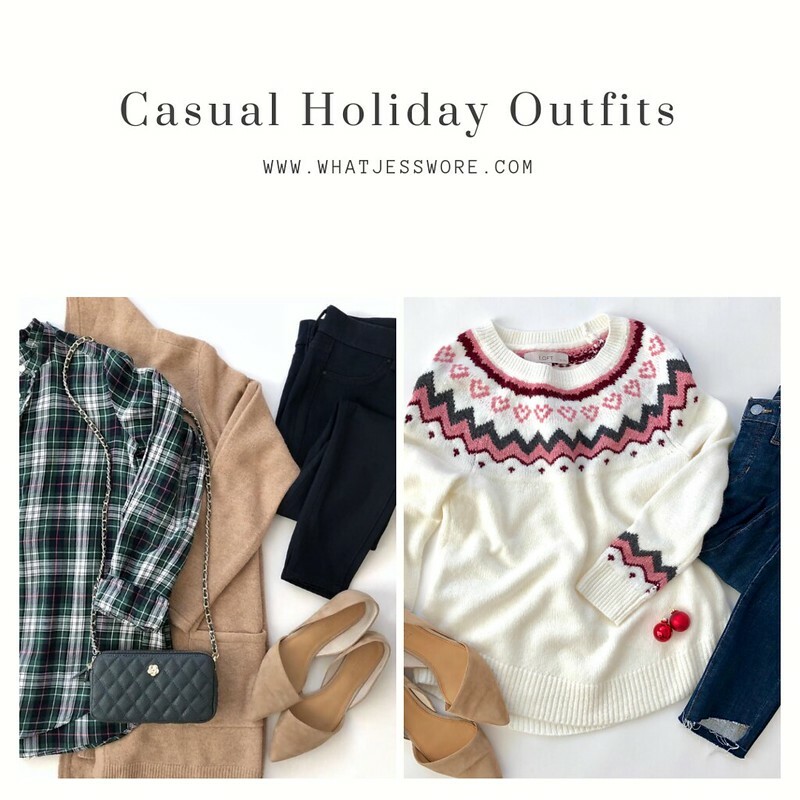 J.CREW – Update 11/23: Get 50% off your purchase at J.Crew using the code TGIF. Valid in stores and online through November 24 at 11:59PM ET. I believe this is the first time ever that they’ve offered a straight 50% discount. (Last year it was 40% off plus an extra 10% off which is 46% off.) Refer to my review of the Chateau Parka here which is currently $219 after discounts. 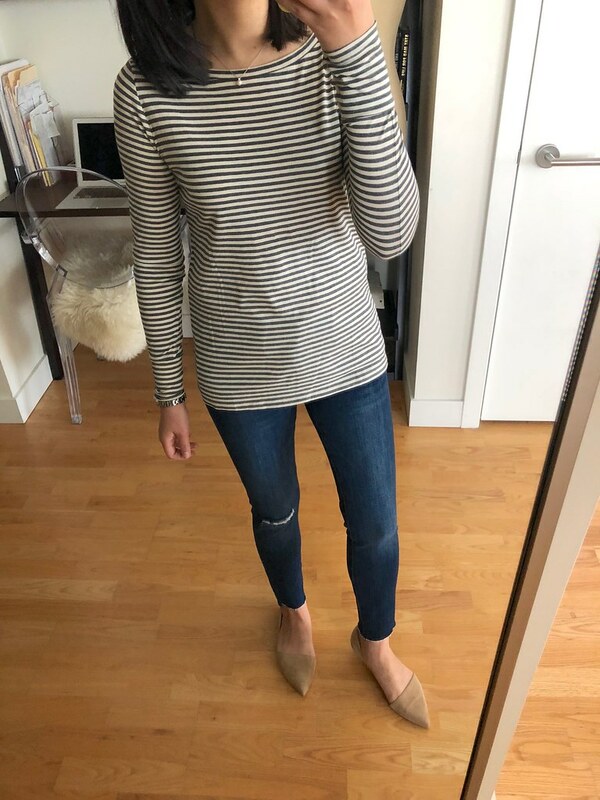 Check out my other J.Crew reviews here. J.CREW FACTORY – Get 40-50% off everything. Use code ADD2CART. Valid in stores and online through November 24, 2018 11:59PM ET. Meanwhile get 60% off everything in stores through November 25, 2018. I reviewed the Vail parka here which is currently $188 after discounts. 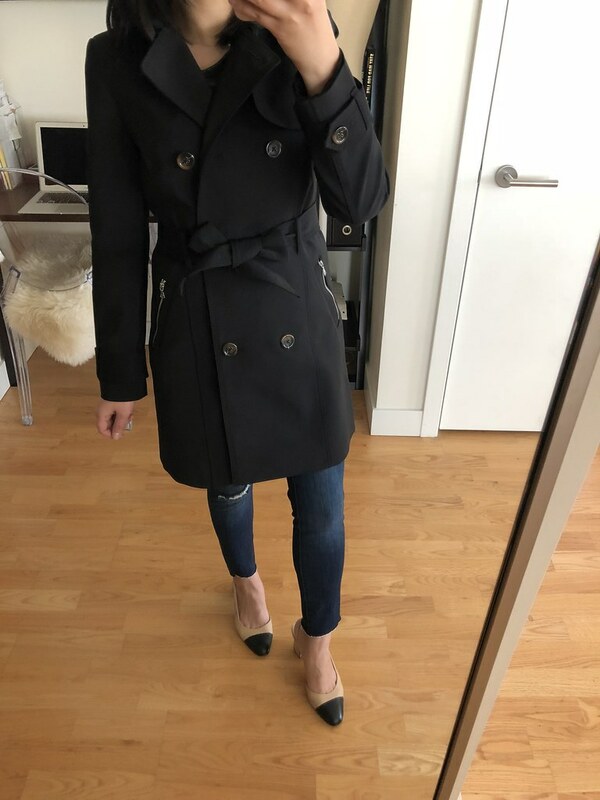 This bow-front coat is back in black this year (review here)! Refer to my other J.Crew Factory reviews here. MACYS – Shop their Black Friday doorbuster deals. Refer to my recent Macy’s reviews here. MADEWELL – Get 25% off your purchase with the code DEALWITHIT. NORDSTROM – Get up to 60% off during their Black Friday/Cyber Monday sale. Refer to my Nordstrom reviews here. NORDSTROM RACK – There are so many good deals including an extra 30% off clearance. I spotted these slim calf Hunter Refined Gloss Rain Boots last week (in Willow Grove, PA) for just under $80 in store even though they’re sold out online. My usual size 7 was very roomy so I want to try them in size 6. I also found them on Amazon and Zappos but I wish they were cheaper. There’s a non-glossy version and the oxblood color is currently $115.50. Update 12/14: The rain boots in this style run true to size so I wouldn’t recommend sizing down (review here). OLD NAVY – Get 50% off your entire purchase. Sale ends Friday 11/23. I ordered this long sherpa faux-suede lined coat in XSP to try in both colors and they will arrive on Friday and Saturday according to the tracking numbers. My husband got this shirt to match me in his usual size (shop more of his picks here). TALBOTS – Get 50% off one item until noon Friday and 40% off your entire purchase until midnight Friday 11/23. I wish they would offer free shipping too. 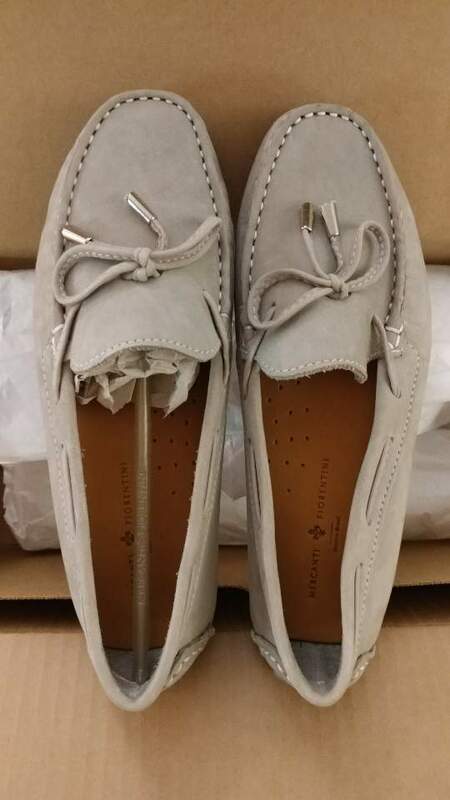 I’ve been eyeing these Francesca driving flats but I haven’t pulled the trigger yet this year. I also like these classic black Lilia block-heel ankle booties with a little bow detail in the back. If you’re shopping in stores tomorrow they are gifting a cute black watch plaid fleece blankets when you spend $150+. TARGET – Check out their Black Friday deals and doorbusters for great savings! TORY BURCH – Get 30% off $250+ with code THANKS. Exclusions apply. Valid through 11/26/18 at 11:59PM PT. I still love and wear my Sullivan tall leather boots from a few years ago and I always get a lot of compliments and questions about what brand they are when I’m out and about. I was lusting after the Lee Radziwill satchel but it sold out online. The following items are arriving on Friday or Saturday. I also have items from Ann Taylor to review as well so I’ll try do another review soon before the long weekend and all the sales are over. You’ll see me uploading new photos and video clips to Flickr as I work on the next post.